When we sustain an injury through an accident, wear and tear, through sport or even through our yoga practice, we look to methods and techniques that will promote healing as fast as possible. The care we receive from our doctors, physiotherapists and other therapists can be hugely complemented and enhanced by a regular yoga practice. Yoga can provide a multi-faceted approach to any difficulty that we face in life, be that on a physical, mental or emotional level. When we get injured, the pain that we experience can quite often be on a few different levels. Accompanying the physical pain and loss of function or movement, we can experience stress from the trauma of the incident or accident that caused our injury. We may be worried that we have to take time off work or that we can’t look after our children. If it is a sports injury, we may worry about the effect the injury will have on our future performance or even sporting career. Unlike medical treatment which addresses primarily the physical injury, yoga can help to alleviate the mental and emotional stress surrounding the injury, as well as stimulating the body’s natural healing mechanisms while gently bringing range of motion, function, strength and flexibility into the affected body part. A regular yoga practice will develop an increased level of awareness where you will become more mindful of your posture and the way you move, and also of your internal attitudes and tendencies. You will begin to notice your internal dialogue. For example, if you are an athlete you will notice if you tend to push yourself through physical pain, risking damaging your body further. You will notice if you allow yourself time to rest and recuperate or not. You will notice if you constantly compare yourself to other people. You will notice if you resist what life throws at you, or if you can accept both the good and the bad in life. 1. Asana: Asanas are the physical postures or exercises that are used to align the muscles and bones, and build strength and flexibility. A healthy muscle is supple and strong. A healthy joint has a good range of movement and allows you to move freely in a confortable way. Asanas will promote the health of all of the body’s tissues. 2. 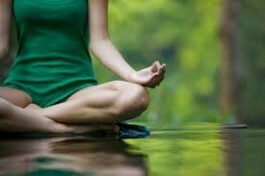 Pranayama: Pranayama comprises the breathing practices associated with yoga. The most powerful thing you will learn when you first start yoga is how to BREATHE properly and efficiently. This will reduce the stress in your mind, your body and your life. It will promote healing in the body, it will help you deal with your emotions, it will improve your lung capacity as an athlete. And you don’t need a yoga mat to do it. You can do it anywhere. In fact, as you are breathing all the time anyway, you may as well do it in a conscious, mindful way to promote your health and well-being. Breathing techniques can be used during injury to direct prana or energy to the affected area; this will improve blood-flow and lymph function which will stimulate healing. 3. Meditation and Relaxation: Meditation is a way of calming and quieting the mind and relaxation will release stress from the mind and body. Meditation and relaxation may also help manage or reduce pain and promote a good night’s sleep. When looking to start a yoga practice post-injury, speak to your doctor or therapist to ensure it is suitable for you to start a practice. Then consider whether you would like to join a general class or work one-to-one with a yoga therapist. Always inform your yoga teacher of your injury and restrictions.